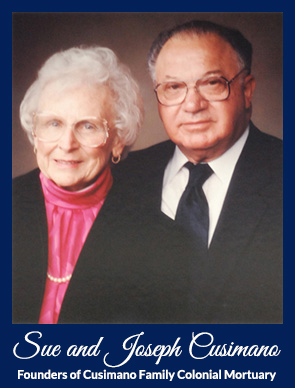 The Cusimano Family Colonial Mortuary was founded in Mountain View, CA by Joseph and Sue Cusimano in 1957. Since that time, we have been providing exceptional personal service to the families of all faiths in the communities in the Santa Clara Valley, including Mountain View, Los Altos, Palo Alto, Sunnyvale, Santa Clara, and San Jose. Whether a family wants a full service funeral with burial in a cemetery or simple burial or cremation, the level of service remains the same. We take great pride in satisfying the needs of the families we serve, and treating them with the dignity and respect they expect in coming to us during a difficult time in their lives. Although Joseph and Sue are gone (Joe in 1999 and Sue in 1991), the Cusimano Family Colonial Mortuary is still independent and family-owned and managed. Their children, Sherri Cusimano and Matthew Cusimano are the owners today, and are committed to providing the high level of service that the Cusimano Family is known for throughout the churches and comminities of Santa Clara Valley. The Bernadette Lodge of the Y.L.I.